4 x Fs. (Frequency sample). standard 1024 taps to 4096 taps at 80 bits as standard. results making new formats an unnecessary distraction. 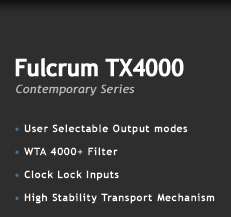 incorporating the very large 4096 tap length filter. album title and track title whilst the disc is inserted. which may be switched off for minimum interference.